Posted by Equestrian Australia on 26/04/2017. Equestrian Australia (EA) has finalised its four-year Strategic Plan. Central to everything, is “For the love of the horse”, with our vision and six key priorities inextricably linked to this. Each component of our strategy is deliberately connected to emphasise the unified, consistent, measured and proactive approach required for the advancement of Equestrian sport. We recognise the landscape of participation is changing. EA needs to become more meaningful and connected within the community. This will be achieved through increased levels of communication and user-friendly digital resources while seeking to provide greater flexibility for access into the sport through the development and execution of highly effective pathways for athletes, coaches, and officials. We will be leaders in safety and risk management practices and policies and will champion the implementation of safety initiatives across Australia for horses and riders. We will implement a two-tiered High-Performance plan centred on the “current cycle” to focus on medal delivery at Tokyo 2020 and the “future cycle” to identify talent and implement a development program integrated with the State branches and Australia’s Winning Edge (AWE) objectives. We will also develop both athletes and horses for future elite levels, across all disciplines, to ensure we remain globally competitive. We will identify opportunities to highlight and promote equestrian sport in an effort to raise its profile across Australia. We will build and foster relationships with external stakeholders and corporate partners to ensure we remain current for our members. We will initiate change in our business to constantly improve the environment in which we operate, to ensure we maximise the visibility of the sport. We will build a financial and cultural foundation from which the sport can extend its reach and capacity. Strong governance, effective leadership, efficient procedures and best practice administration management will ensure we achieve success. We will work proactively with all levels of the sport including state branches, members, organising committees and volunteers to collaborate and achieve the best outcomes for the sport. 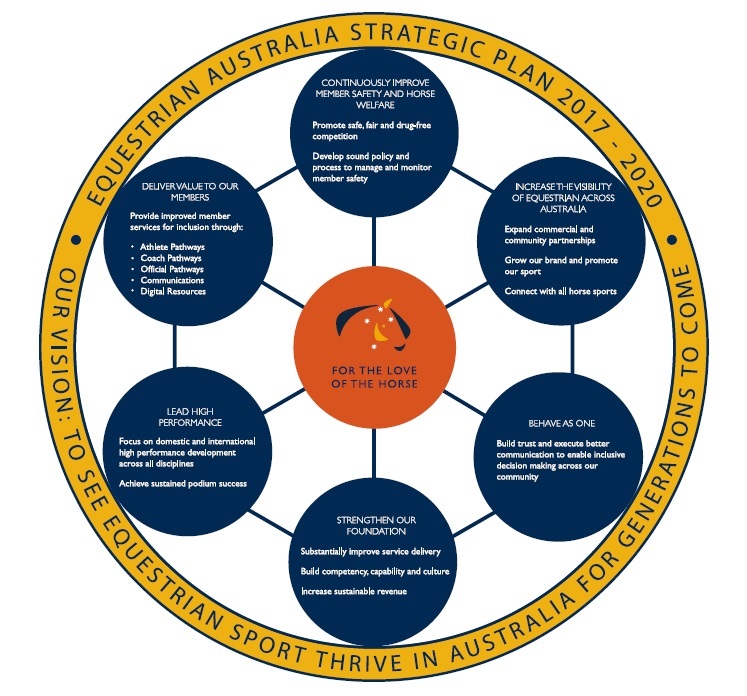 Each of these priorities are supported by a detailed operational plan that will adapt and evolve over time to ensure that Equestrian sport advances and grows throughout Australia over the next four years and beyond. EA’s Chief Executive Officer, Paula Ward, said the new vision for Equestrian sport is an important, exciting and timely step forward in a highly competitive and challenging landscape. “This plan has been developed through a collective and consultative approach with the State branches, with additional feedback taken on board from a number of stakeholders, including Equestrian Australia members through the Economic Impact Member Survey and we are pleased with how it has all come together” Ward said. “This four-year plan will set the foundation for Equestrian sport to thrive in Australia for generations to come,” she said.